Community Blog - How Green Can You Be Living in the Desert? How Green Can You Be Living in the Desert? Part 3... A Model for a Greener City? 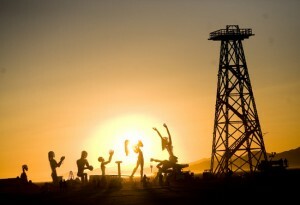 Now may be a good time to bring up the-man-that-burns part of Burning Man. A man does indeed burn but tis of the woody structural kind rather than the flesh and bones variety. At the end of this week-long festival the great man, which stands at the centre of the desert camp, is lit up as a symbol of release (emotional, spiritual or whatever you'd like it to represent). But of course, as the burning of things does require, it also releases a whole lot of carbon into the atmosphere. This festival/community/city is perhaps not yet a model for green living but it does provide a very real and experimental arena to educate yourself on how to improve and sustain certain aspects of your life in your ‘other home'. Nature never made a plan, nor does it seem to copy very well. No living thing is ever quite the same as others of its kind. Charles Darwin called this Natural Variation. There is a kind of subtle chaos, a supple element of chance and change, residing at the core of living things. Our theme this year prompts three related questions: What are we as human beings, where have we come from, and how may we adapt to meet an ever-changing world? I'll report back in a few weeks to let you know if I come up with any answers. In the mean time for more details and images of this extremely (in all senses of the world) extraordinary festival visit www.burningman.com.